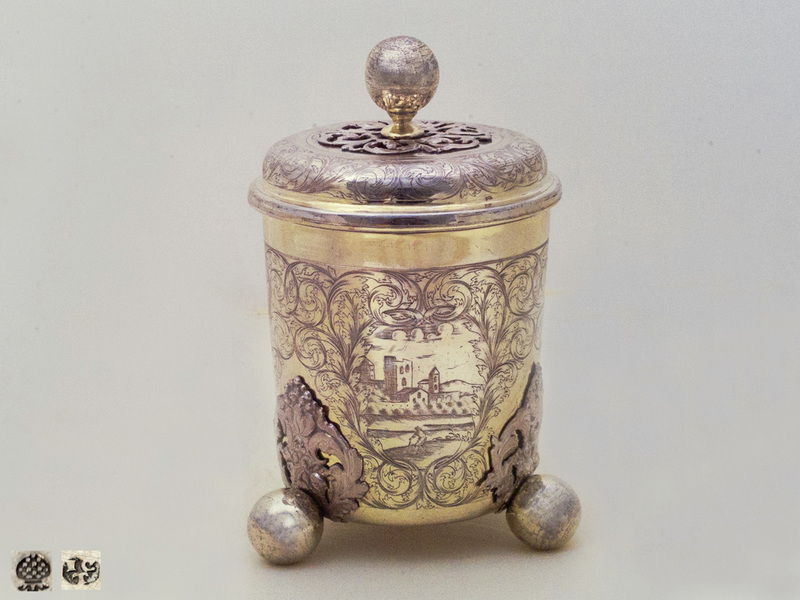 The present silver beaker shows an elaborated and very detailed artwork from Augsburg. 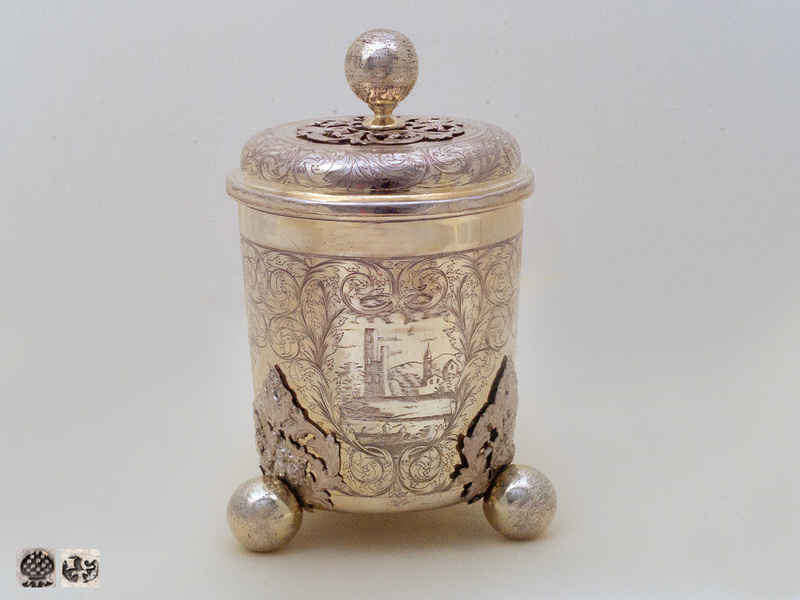 It is entirely gilt and adorned with deep and fine engraving. The straight body stands on three ball feet and has three engraved cartouches showing different landscapes. Among the three cartouches, the corpus is decorated with again very detailed foliage, which takes the form of acanthus leaves. The cover is detachable, profiled and also adorned with the engraving of a detailed foliage, just like on the body. 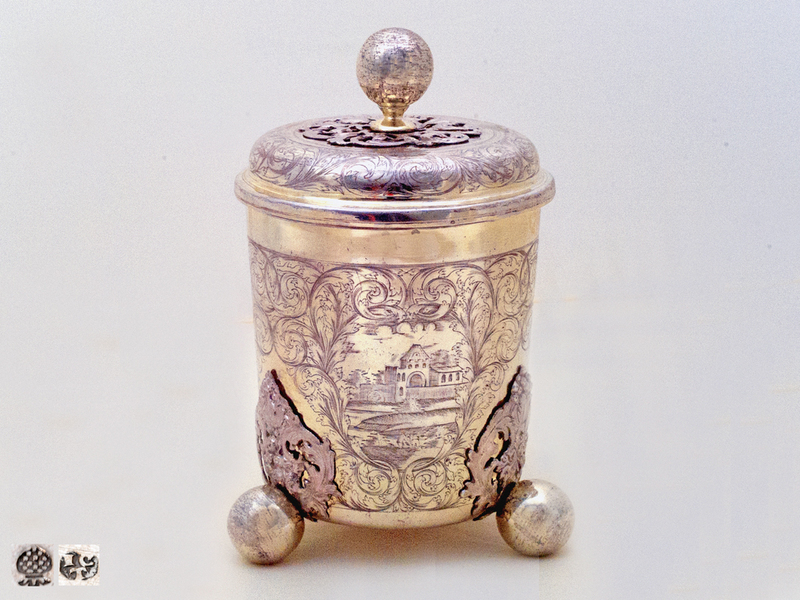 Between the knob, which is a ball, and the cover, there is an element formed in open-work, richly decorated. This way of holding the ball attached on the cover is repeated on the three ball-feet: this time, the embossed element between the ball and the body is larger and conical, showing acanthus leaves, fruits and on the top grapes. The marks are ligated on the underneath side of the corpus and on the cover. The uniqueness of the beaker lies not only in the way it has been worked and in its very nice gilding, but above all in the three cartouches with the landscapes and the engraving on the whole. The body is very finely engraved, and the cartouches present each three different landscapes with staffage figures. Adorning the beaker like this represents a decoration style quite popular in the seventeenth century. In the first cartouche, there is represented a part of a village with its church, houses and other buildings. In the foreground, a farmer is plowing. In the second cartouche, there is again a part of a village or a town with its different buildings. This time, in the foreground, there is a boat with three fishermen in action on a river. In the third, it is depicted a gate with several buildings. Right on the waterfront, a person – probably a fisherman-, is in action. Through the careful and studied representation of the staffage figures on all three cartouches, the scenes of the beaker gain an aliveness. Moreover, and staying close to the principles of the landscape painting, these figures offer to the observer the possibility to realize the space and its dimensions. During the Baroque period, interest in landscape painting was growing. 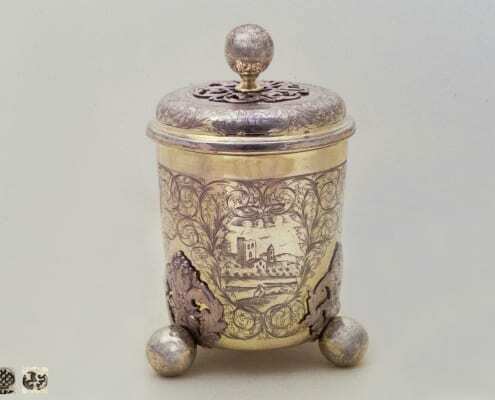 In the domain of decorative arts and, especially silver, many drinking vessels and other objects were adorned with architectural settings and cityscapes during the seventeenth century. These works follow the artistic developments and decorative fashions of painting. Compare here another baroque beaker with engravings of landscapes of the maker Johann Jakob Petrus, also in the collections of Helga Matzke. In order to compare the type of beaker (with the detachable acanthus leaves), see in the collections of the Grünes Gewölbe in Dresden, two beakers from the same period, made by Carl Schuch. 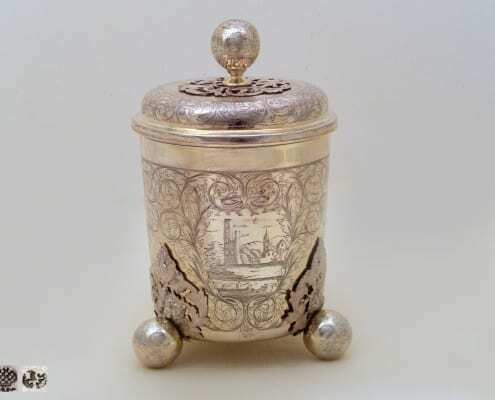 Johann Christoph I Treffler was a goldsmith and silver worker, born in 1652. He became in 1680 master maker and got married to Anna Maria Baur (daughter of the goldsmith Hans Jakob II Baur) in the same year. In 1682, he got married for a second time. He died in 1722. 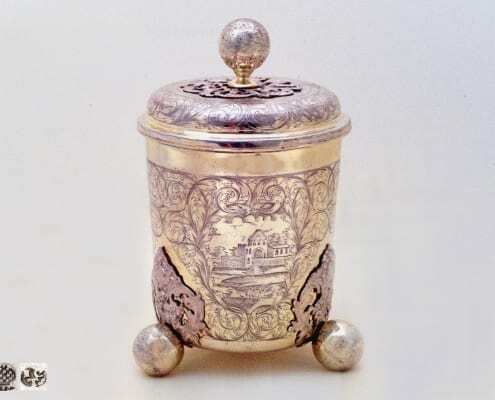 Helmut Seling mentions a series of objects of Treffler which are held in important museums and private collections: in the Grünes Gewölbe, Dresden; in the Bavarian National Museum, Munich; in the Kunstgewerbemuseum [Museum of Decorative Arts], Berlin; in the Historical Museum of Moscow.